Latter-day Saints are more likely to get married than members of other religious groups in the United States, and less likely to divorce. Church members also have significantly larger families. These are some of the findings of a study reported at the conference of Brigham Young University’s Family and Demographic Research Institute this spring. The study was performed by Tim B. Heaton, an assistant professor of sociology at BYU, and Kristen L. Goodman of the Church’s Correlation Evaluation Department. Their findings support beliefs about the strength of families among Latter-day Saints, and contradict statements that the divorce rate is uncommonly high among Church members. The two researchers stressed that their results do not necessarily mean an individual’s religion determines his or her choices about marriage and family. “Not only do people use religious teachings as a guide for behavior, but they also select religions that are consistent with their personal preferences. “Perhaps no other societal institution has a closer link with religion than does the family,” the two scholars wrote in the report of their work. Religion touches on the decision to marry, choice of mates, the marriage ceremony itself, decision to have children (and how many), sexual behavior, and dissolution of the relationship. Most Christian religions support marriage and family. The ever-more-common decisions to delay marriage, seek divorce, and limit family size go against most religious traditions. “We suggest that, even amid dramatic changes in nationwide patterns of family formation, religion still plays an important role in family life,” the two researchers commented. How important a role religion plays in LDS family life is apparent, although data supporting that fact are not plentiful. Previous research has established that there is a link between the degree of Church activity and family size among Church members. But “little attention has been given to the influence of religiosity upon other aspects of family formation among ‘Mormons’,” Brother Heaton and Sister Goodman reported. 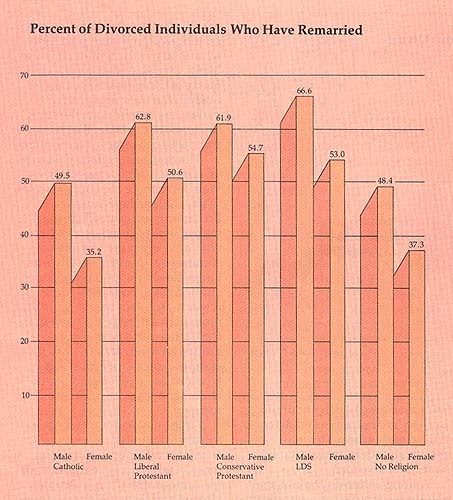 Accurate statistics on marriage, divorce, and remarriage have been scant. Too often, small, unrepresentative samples of Church members have been used in research, making the findings of many studies suspect. Brother Heaton and Sister Goodman took their data about LDS families from a survey of 7,446 randomly selected Church members in the United States and Canada. That survey was mailed in the spring of 1981; through follow-up contacts, responses were eventually obtained from approximately 81 percent of those on the list. Data about non-LDS families came from the National Opinion Research Center’s Cumulative General Social Surveys taken in the United States during 1978, 1980, 1982, and 1983. Results from several years were used in order to get a sample more comparable in size to the LDS group surveyed. The non-LDS group was divided into Catholics, conservative Protestants, liberal Protestants, and those who professed no religion. Sister Goodman explained that researchers often categorize Protestants in two main groups. The liberal Protestant group includes Methodists, Episcopalians, Presbyterians, and Congregationalists, and the conservative Protestant group includes those who list themselves as members of Lutheran, Baptist, Church of God, Church of Christ, Assembly of God, Holiness, Jehovah’s Witness, Nazarene, Pentecostal, Seventh-day Adventist, or United Church of Christ congregations. “Among the religious groups, ‘Mormons’ have the highest rates of marriage, exceeding ninety-seven percent for males and females,” the two researchers reported. 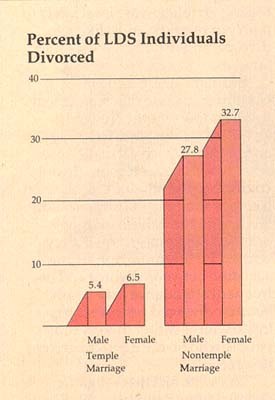 Those figures are for individuals over thirty, since most people have married by that age. Conservative Protestants follow Latter-day Saints closely, with ninety-six percent who marry, and “liberal Protestants lag behind slightly with percentages of ninety-three for men and about ninety-five for women.” Catholics follow, with eighty-nine percent for men and ninety-one for women. The research showed that only 81 percent of the men and 87 percent of the women who profess no religion marry. When the researchers compared the tendency to marry with the frequency of church attendance, they found that males who attend frequently, in all religious groups except Catholic, are more likely to marry. The research makes it appear that the same is true for females who attend church frequently, but a statistical margin for error is inherent in the survey. 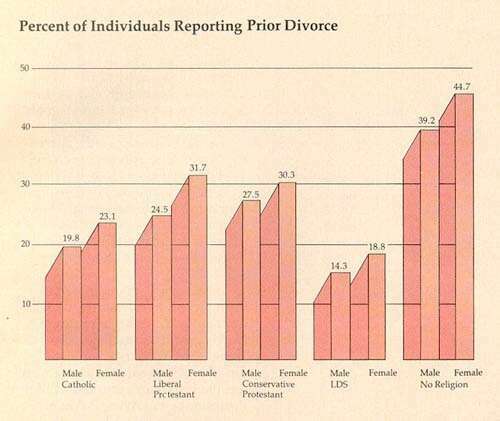 Divorce is found among all groups, but those who profess no religion have by far the highest rate. Some 39 percent of the men and 45 percent of the women in this group have experienced at least one divorce. Among liberal Protestants, about 25 percent of the men and 32 percent of the women have been divorced. For conservative Protestants, the figures are about 28 percent for men and 30 percent for women. Approximately 20 percent of the Catholic men and 23 percent of the women have been divorced. About 14 percent of the Latter-day Saint men and 19 percent of the women have experienced divorce. Within each group, frequent church attenders are less likely to have been divorced. Among Latter-day Saints, marriage in the temple has a significant effect on the divorce rate, Brother Heaton and Sister Goodman reported. “Nontemple marriages are about five times more likely to end in divorce than temple marriages.” About 5.4 percent of LDS males who married in the temple were later divorced, and about 6.5 percent of the females. By comparison, some 27.8 percent of nontemple LDS marriages ended in divorce for men, and about 32.7 percent for women. In reporting their findings, the two researchers noted that if there were some measure of religious commitment comparable to temple marriage among other religions, statistics for those groups might also be more favorable. They noted that the LDS emphasis on the sanctity of marriage, along with requirements of worthiness, are strong indicators of religious commitment for couples who marry in the temple. It is also likely, they said, that couples who marry in the temple have previously given their prospective mates very careful consideration because of their belief that such marriages can endure for eternity. The damaging effect of divorce on society is offset in part by the high percentage of people who remarry. Latter-day Saints and Protestants are more likely to remarry, while Catholics and those with no religion are less likely. Almost two-thirds of the divorced Latter-day Saints and Protestants studied have remarried, while fewer than half of the men and little more than a third of the women in the Catholic and no-religion groups have remarried. 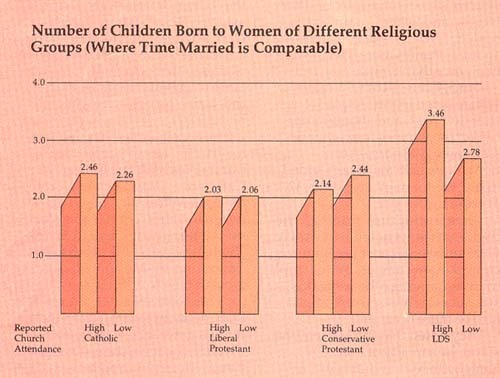 With the exception of liberal Protestant women, those who are frequent churchgoers are more likely to remarry. Latter-day Saints clearly have the largest families, the two researchers reported. Comparing women who had been married for the same length of time, Brother Heaton and Sister Goodman found that Latter-day Saints had, on the average, 3.31 children. Catholics were a distant second, with 2.38, and conservative Protestants were close behind them, with 2.25. Liberal Protestants had 2.04, and those who professed no religion had 2.02. The two researchers pointed to LDS theology as one explanation for this difference, noting the Church’s belief in the eternal nature of the family, and in the bringing of children to this earth as part of a comprehensive gospel plan accepted in premortal life. LDS couples believe they are fulfilling a duty of love in being the means to bring spirits from premortal life to mortality, where further progress toward eternal goals is possible. As might be expected, Latter-day Saints who attend church frequently have more children than those who do not, an average of 3.35 compared to 2.69. Also, those who had temple marriages lead those who had nontemple marriages in number of children, by 3.50 to 2.69. In summary, compared with Catholics and Protestants, Latter-day Saints “have higher rates of marriage and remarriage, lower divorce rates, and larger families,” the researchers said. “Catholics are less likely to marry or remarry than Protestants, but have less divorce and larger families.” Those professing no religion are least likely to marry or remarry, most likely to divorce, and usually have smaller families. Thus, the fact that religious congregations tend to be filled by those who are married, with spouse and child relationships, creates a major challenge for religions in general﻿—the challenge of integrating the never-married, divorced, and childless members in their midst.